Each Spring and Fall, ARCA holds its Volunteer Day at Arlington Historical Museum/Hume School grounds and at the PEG project sites, I-395 and Prospect Park and the triangle at Fort Scott and S. 23rd Street. Around Hume School, we continued weeding, planting new shrubs and plants, pruning the three garden areas, and general cleanup. The County provides us tools and mulch, and six years ago the County and Extension Service help provided the impetus to take this effort beyond three over-the-hill retirees trying to clear stairs and walks, to a total grounds restoration, and creation of a park environment behind Hume, incorporating three County parcels in addition to the Arlington Historical Society hill parcel behind the school. This project is under the able stewardship of Chick Walter, past president of ARCA, coordinator of the Friends of Hume School and chairman of the grounds committee of the Arlington Historical Society Museum (Hume School). Friends of Hume School Volunteer Day – May 5, 2012 Partnering with the Church of Jesus Christ of Latter-day Saints Church for their Community Day of Service, Friends of Hume School enjoyed another successful neighborhood volunteer day. With over 50 volunteers, the grounds at Hume School were weeded and mulched and we were able to assist the County with the PEG installation at I395/Ridge. As always, a highlight of the day was the delicious chili-dogs provided by our neighbor Rich Kelly. When you get a chance, stop by and see how beautiful the Hume School grounds look!! Directions: From South Arlington Ridge Road turn west onto South Meade Street (just down the hill from South 23rd Street intersection). 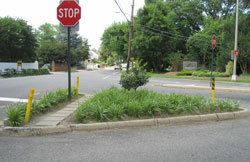 On street parking available, or in nearby Oakridge Elementary School lot or Gunston Middle School lot. The work area is between Haley Park, Oakridge Elementary, and Gunston Middle School. This is an area which is used by the Elementary School and the Middle School for Nature programs, and we would like to have it more truly representative of our local native plants! Volunteers will be freeing up some native plants which are overrun (and removing some trash). The work is mostly on rough terrain, steep hillsides, with uneven footing. There will be poison ivy, though we have some pre-contact wipes. We will focus on ivy, honeysuckle, wisteria, and garlic mustard. Volunteers should bring/wear stout shoes with good tread for traction, water bottle, long sleeves and long pants, hat and work gloves, energy and enthusiasm. Bring clippers if you have them, but we will provide some tools. 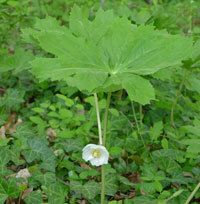 Knowledge of invasives helpful, but we will train you!